Outside of the actual paint scheme, you really do need to mark your vehicles. 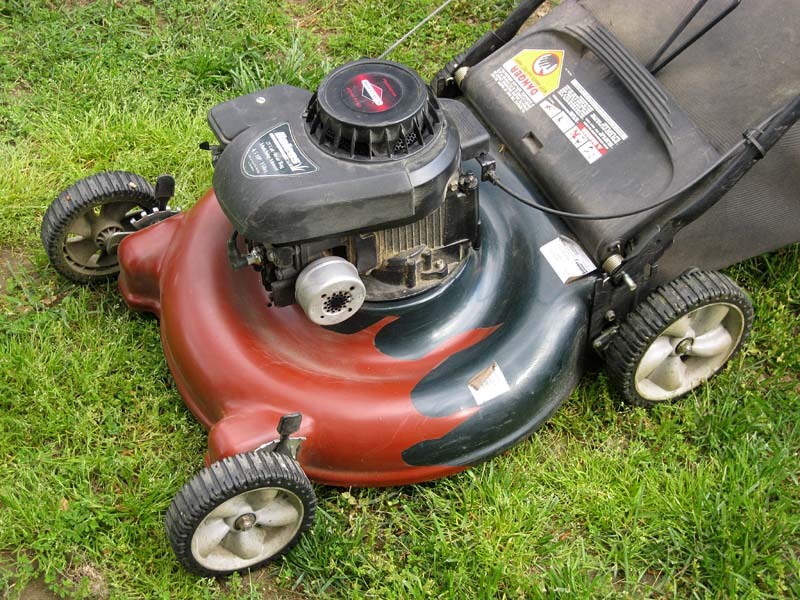 As I set about cutting the grass this past weekend, I decided that I needed to add flames to my lawnmower. A rather spur of the moment thing, but it had to be done. It took about 15 minutes total (including clear coat) to get this finely decorated war machine ready for battle. I can't look at it without smiling and being so proud of it. It's one thing to get your vehicles painted up in 40k. It's another to go that next step and tie them in with your force. 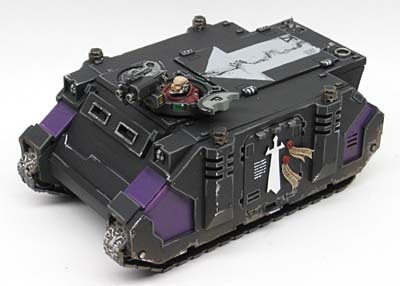 Instead of just fielding a blue Ultramarine Rhino, why not assign it to a squad and give it the appropriate markings and numbers? I'm not even getting into weathering here, just a few simple numbers and such to add some character to your vehicles. I've talked about it before with when to do freehand and how to do it posts. You don't have to go all out either. Nothing says you need to cover your vehicle in freehand for it to look good. A simple arrow or design on the top can do wonders. Don't get me wrong, a nice freehand design can absolutely change the look of a vehicle, but it's not a game breaker. Sure this guy might look really nice, but he's going to draw a substantial amount of firepower putting that Armour 14 to the test. Even if it's empty, your opponent may want it destroyed just so you can't parade it around the table showing it off. Whether you add a simple icon to the side doors or some basic freehand, it will go a long way towards giving your vehicles a "finished" look and bring them into your force in a unified way. It's a big return for a small investment. As soon as I finished painting my lawnmower, it broke and I had to replace the spark plug. But... it does go faster now. All your mower needs now is Grot riggers, oh and maybe a death rolla! Numbering, colouring or glyphing to go with a squad works wonders in making an army look cohesive, and it's not much more effort than doing it to an infantry model really. Sweet mower... I can't believe your wife wasn't impressed... Come to think of it, I don't think my wife would be impressed either. Now if I started it and used it a little more often, that would impress her. 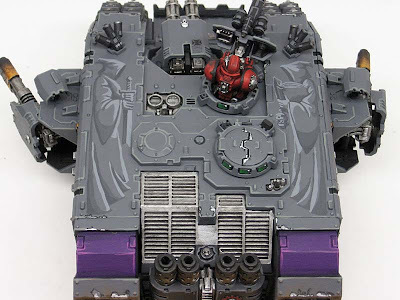 One thing I'd really love to see an article on in the future is how to appropriately "map out" more complicated freehand like those Watchers on the Land Raider. I can do block freehand and basic script on my Ultramarines, but it's the multishade stuff that I have trouble planning out. As long as the grass gets cut, my Wife will tolerate it. Although the idea of some glyphs does sound very cool. TheRhino: Let me see what I can put together. The process is fairly simple really. All the work is done in the beginning. By the time you get to paint the image on your vehicle, the hard part is done. It's extra easy if you play marines, since they are so very very organized. My Rhino's have 1, 2, etc on them on so does the marines that "belong" to them. Plus correct company colors to match:) It's super simple and it makes it easier for anyone who isn't actively trying to cheat. I didn't see the V on the Rhino at first so I was a bit confused for a while:) I guess I've grown used to the number being on the "classic" spot :) But I'm all for making your miniatures yours. Heck, it should be the goal! A bit off topic but how do you paint the headlights on your rhinos? I'm having real problems with them. I'm looking forward to marking my vehicles to their squad and to their role. However, I first need to get everything field-able (with paint done). Classic mower conversion. Well done. Gives new meaning to wirking with green stuff. Wow, I guess I'm lucky. I doubt my wife would care as long as I didn't break the mower. "I can't look at it without smiling and being so proud of it. My Wife was not impressed." I had to laugh that is pretty much the same reaction that my wife has to most of what I do. For my DE I have each squad individualized so that no matter how mixed up a mob gets each squad is clearly identifiable. I have gone on and created a token rider for each squad so that no matter which ride they are in it is clear which unit is embarked. I would rather put in the work to have everything easily identifiable at a glance than to have an "oops" moment and leave an opponent with a sour taste. I left one earlier but it looks like Blogger ate it along with some other things with the recent maintenance issues. TheRhino: I will see what I can put together along the lines of mapping out the more complicated freehand designs. I laughed quite a bit at "My wife was not impressed." This article gave me some more ideas for my army. Once I get it all done I'll take some pics. I really like Black Matt's Black Legion Rhinos and am hoping to do something like that for my Templar Rhinos. Mine are second hand, and black, so they satisfy the barest of essentials. But I really think getting different aspects of the Maltese Cross happening will add a lot of life to them. It is so easy to ape the atypical stuff GW puts out. Time to tap into the creativity that is intrinsic to humanity! For my Tau vehicles, I want to paint the pattern of a whale-shark onto one of them, to get the fish theme happening. I've never airbrushed, so that'll be fun, lol. Ron, I'd love to see a gallery of your characters that you've made, like that Ragnar you did. The front cover of the Templars codex also has a sweet conversion idea on it, with those servitors carrying the reliquary of the book and bones, plus the broken sword. Hint. Plus the two Knights with Great swords, just waiting for Ron to make them. Hint. Marshal: I do need to put up a proper post on the Ragnar model I made. I haven't done it yet and you're the second person to ask now. I do have a Templar Chaplain I just finished and will be posting pics of this coming Monday. I copied the artwork from inside the 4th Ed rulebook. Truth be told, I do character models as people come to me with the projects. I do have one in the works for myself, but it's hard to find the time to work on it.